Pro-Ject Primary E: a new £150 plug-and-play turntable with 5-star foundations | What Hi-Fi? It's essentially a more affordable (and very slightly updated) version of the five-star Pro-Ject Primary. 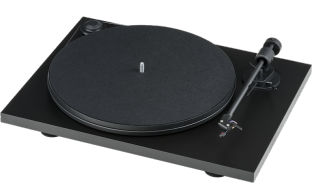 We’ve seen our fair share of super-cheap budget turntables over the last few years courtesy of the unrelenting vinyl revival, but the best of the bunch has arguably been Pro-Ject’s Primary (£170) and Elemental (£150) decks. The former received five stars from us last year but now appears to have a limited shelf life ahead of it - which would be a shame were it not for the fact a very similar and even more affordable turntable will soon take its place. The £150 Primary E uses the same 8.6in aluminium tonearm, which is pre-configured to match the pre-installed Ortofon MM cartridge it’s attached to - meaning there’s no need to set-up the tracking force or anti-skate during installation. Attach the belt, hook it up to a MM phono stage, and away you go. The difference? Unlike the Primary, the new E model has a direct-to-mains 230V motor built-in, negating the need for its plug to house the power supply instead. It’s also only available in a black finish as opposed to a red or white one, too. History would tell you that the Pro-Ject Primary E could be a good pick for anyone after their First Turntable. And as we already have a sample in our test rooms ready to spin our vinyl collection on, we’ll be finding out whether indeed history will repeat itself or not very soon.